Precision manometer measures wind speed and pressure. Users examine the relationship between the air resistance and the flow speed with a circular disk. The flow speed is measured with a pressure head sensor and the air resistance with a dynamometer. The machine also determines the drag coefficient for various flow bodies with equal cross-sections. 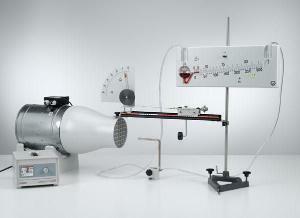 The flow speed is measured using a pressure head sensor and the air resistance with a dynamometer. Users measure the static pressure at various points on the underside of an airfoil profile. The measured curve not only illustrates the air resistance but also explains the lift acting on the airfoil. Ordering information: This kit includes a suction and pressure fan, aerodynamics working section, aerodynamics accessories, measurement trolley for wind tunnel, sector dynamometer 0.65 N, pressure head, precision manometer, small and V-shaped base, saddle base, 47 cm and 12 mm ø stand rod, and airfoil with lateral sheets.